Bought this nifty pistol-grip gun a few years ago to replace my old school long-handled grease pumper. One of the best upgrades I’ve made, tool-wise. I’m just too lazy to tighten and loosen the coupler for every zerk fitting in order to keep both of my hands free for pumping. Especially when that coupler gets all slippery with grease. Having one hand free to hold the coupler on the fittings instead makes a huge difference. 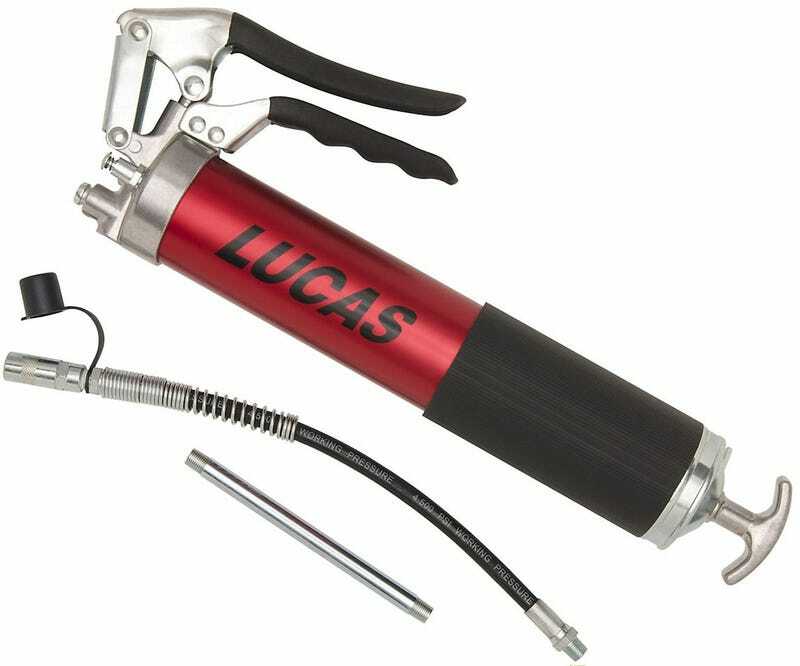 When I first got it, I dropped a tube of Lucas’s “Red ‘N’ Tacky #2” in there and have been using that ever since on U-joints, ball-joints, tie-rods, etc. I haven’t had any problems with it, but if there’s any reason to start using something else instead, now’s the time. It took a while for me to get through that one tube, and I’m sure it’ll be a while before I get another opportunity to change my mind. So what chassis greases do you like, Oppo? Have any lessons to share from high-stress racing applications, or heavy-duty use? Any bad experiences from using certain brands or formulas? Have you seen one product performing demonstrably better than another?